A great activity for combining art and craft with keepsake items that will last forever. Can also double as a Valentines activity. 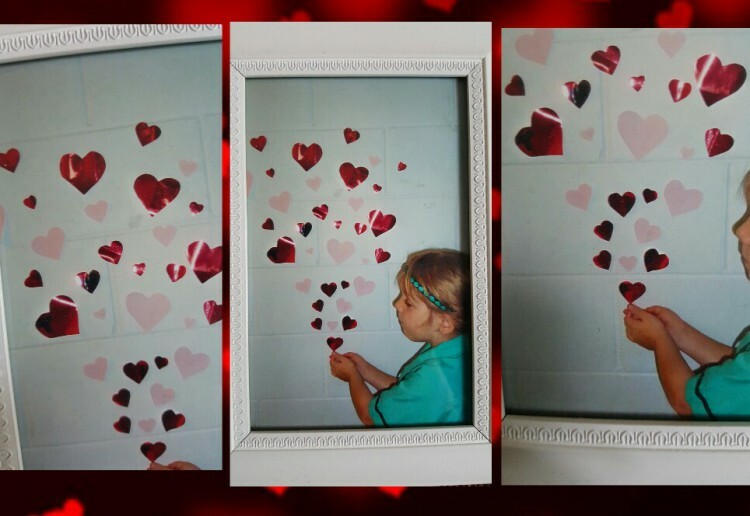 Draw some love hearts on your paper and cut them out. Its best to to around 20 Smaller hearts and 8-9 bigger heats. Stick them on the wall (tiles area is best, we used the shower) in an arrangement from small to large as shown in the picture. Have your child cup there hands at the bottom of the hearts as if they are magically appearing out of their hands. Take a photo and Frame it to keep forever. Notes... You can opt for any shape. We have also used butterflies and stars. Very cute and easy to do at home! Looks like the perfect Valentines Day project. Thanks. A very sweet sentiment, thank you so much for sharing Kate. My kids made these at school but their blowing the hearts like blowing kisses and framed it in their own paintings.. I had to buy them at the school fair. Absolutely beautiful and easy to make too. Thank you. Very creative and pretty! Wonderful for Valentines Day! Creative and beautiful and the way to someone’s heart! Looks pretty. Simple idea but one i would never have thought of. This is a great idea for Valentine’s Day (or anytime really). What a magical idea. LOVE Love love it. Thanks for sharing Kate. This is such a cute idea. Easy to make and sweet! !